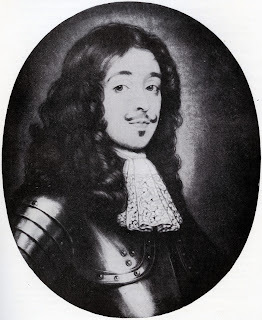 The close association between the Tyldesleys and the Stanleys was to end at the Battle of Wigan Lane on 25 August 1651 when Sir Thomas Tyldesley fell fighting alongside James Stanley, the 7th Earl of Derby. James Stanley was to be executed later in the same year, on 15 October 1651, having sought and been refused permission first to visit Tyldesley's tomb. I hope the private peeke betwixt Ned Tyldesley and Mr. Sheriff will not be a sufficient cause to judge all of his Faith like Phanaticks [i.e. Quakers and extreme dissenters] ; they weare otherways esteemed in the late Warr and accrewd a good opinion by theire faythfull servise, and they are in some other countys to my knowledge better esteem'd, and not ill by his Majestie. My Lord, notwithstanding what I write on their behalfes, I have nothinge to doe with theire Fayth, whearin they dissent from us ; nor as theye are generally of my Kindred, which I cannot helpe; but I have the fayth to beleeve, out of conversations I have had amongst them, and the experience I have had of theire servise and sufferinge for the King, that they will be as ready as ever, either for the King or Kingdom, against any forraigne power whatever.Nay, I have heard it frequently from them, with many serious conversations, that though the Pope himselfe should endeavour to invade, they would be as ready to sheath a sword in his gutts as any enemy whatever. I humbly beg your Lordships pardon for this bouldnes, which proceeds from what past between us the other day concerning them, which I was not so willing to declare myselfe in then, though I have done it in the Parliament House, when they had like to have been excepted out of the Act of Oblivion. A copy of my Lord of Derby's Order by which Ned Tildesley and Sir Thomas Preston was to bee searcht for Armes, August the 8th, 1666. Whereas I am commanded by his Majestie to disarme all such persons as are observd to keepe horses or Armes above their ranke, you are therefore hereby commanded to make search within this County Pallatine of Lancaster with [which] persons are armed above their ranke and qualitie and give me notice thereof, and to secure them for his Majestie's service. And in the execution of this warrant I doe hereby command all officers and souldiers (and all other persons within this County) to be aiding and assisting to you herein. This shall bee your warrant. Given under my hand and seale the 28th of July (1666). To Lieut. Newton in the County of Lancaster. I would have you to apply yourselfe to some of my Deputy Leivtenants as are next and adjacent to those persons that are armed and horsed above theire ranke for their advice and direction in the execution of this warrant; whom I therefore here desire to be aydinge to you accordingly.You are to make search at the house or houses of Sir Thomas Preston and Mr. Tyldesley of Lodge. A true Copy examined by us 8th of August (1666). Mr. Blood is a slender man some what inclininge to tallness, a Long leane pale face with pocke holes in it. Small grey eyes and hollow, with a light Browne straight haire. [Footnote added later in another hand] This Mr. Blood and his Sone, and Mr. "Moore" weare the persons who attempted to steale the Kinges Crowne out of the Tower and had got it to the 2nd gate. They weare the persons allsoe suspected that assaulted James Duke of Ormond in his Coach and had taken him out to have murtherd him. Thomas Blood notoriously attempted to steal the crown jewels on 9 May 1671, but was already being sought for other offences. Curiously the Tyldesleys were to gain a connection with the Bloods. Thomas Blood's wife was Mary Holcroft, and her niece, Eleanor Holcroft, was to become the second wife of Thomas Tyldesley 1657-1715, the Diarist. 1. Sir Roger Bradshaigh, Arthur Hawkes, Chetham Miscellanies, 1945, Vol 109 at page 38. 2. Hawkes suggests that Bradshaigh had been guardian of Edward Tyldesley, "the infant son of Sir Thomas Tyldesley". This seems unlikely. Bradshaigh was only 7 years older than Edward Tyldesley, and Edward Tyldesley was not an infant when his father died—he was 16 years old.